There are two major kinds of organizational change; change imposed by circumstances and change that is planned and adopted to encourage growth or improvement. This applies to both individuals and large-scale enterprise organizations. Change management systems are designed to help businesses plan for change instead of react to it. As Tony Blair once said, "Ideals survive through change. They die through inertia in the face of challenge." Navigating the sometimes bumpy waters of change can be difficult, but it doesn’t have to be if you plan and prepare accordingly. That’s where implementing an effective change management process can help - luckily, there are plenty of options available. With the overabundance of frameworks and models available to guide and educate on change management practices, it can be difficult to find a perfect fit for your business. Regardless of model chosen, this article provides 8 essential process steps to drive effective change management. The philosophies inherent in today's change management practices are structured to plan (rather than react) to the challenge of organizational change. It's a growing industry with thousands of books and numerous theoretical management frameworks that address both the necessity and the pain involved in managing and planning for change. The concept of change management dates back to the early to mid-1900s. Kurt Lewin’s 3-step model for change was developed in the 1940s; Everett Rogers’ book Diffusion of Innovations was published in 1962, and Bridges’ Transition Model was developed in 1979. However, it wasn’t until the 1990s that change management became well known in the business environment, and formal organizational processes became available in the 2000s. There are concrete reasons for accelerated growth in the change management industry. Products, technology, or ideas that used to take years to design, develop, test, and deploy are now being squeezed down to months or even weeks. The evolving consumer expectations for better, faster, and cheaper products also drive the need to reorganize the work culture to meet demand. Books touting these concepts run from the obvious, such as Change the Culture, Change the Game by Roger Connors and Tom Smith, to Alan Deutschman's dire call to action in Change or Die, Linda Ackerman Anderson’s Beyond Change Management, and Daryl Conner’s Managing at the Speed of Change. In addition, models and certifications from The Association of Change Management Professionals have come to life in support of this growing industry. Change Management has evolved over the past several years with Change Management Models, Processes, and Plans developed to help ease the impact change can have on organizations. So, what is a Change Management Model, a Change Management Process, and a Change Management Plan and how do they differ? Change Management Models have been developed based on research and experience on how to best manage change within an organization or in your personal life. Most Change Management Models provide a supporting process that can apply to your organization or personal growth. 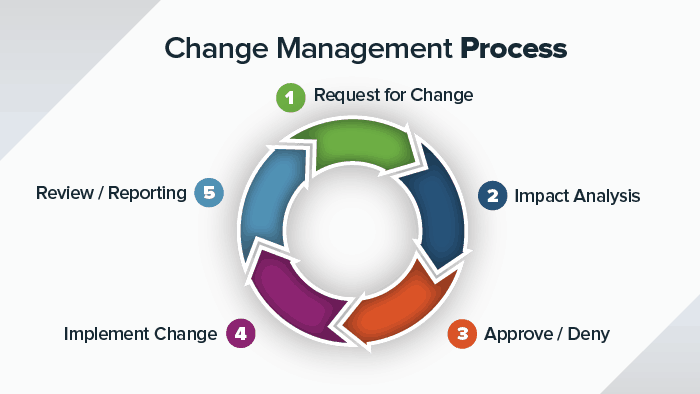 Change Management Processes include a sequence of steps or activities that move a change from inception to delivery. Here is a great resource for an overview of effective change models, methodologies, and frameworks. You’ll find theories such as the McKinsey’s change management framework, John Kotter’s change management model, the Prosci ADKAR process, and the Deming Cycle. Your organization is constantly experiencing change. Whether caused by new technology implementations, process updates, compliance initiatives, reorganization, or customer service improvements, change is constant and necessary for growth and profitability. A consistent change management process will aid in minimizing the impact it has on your organization and staff. 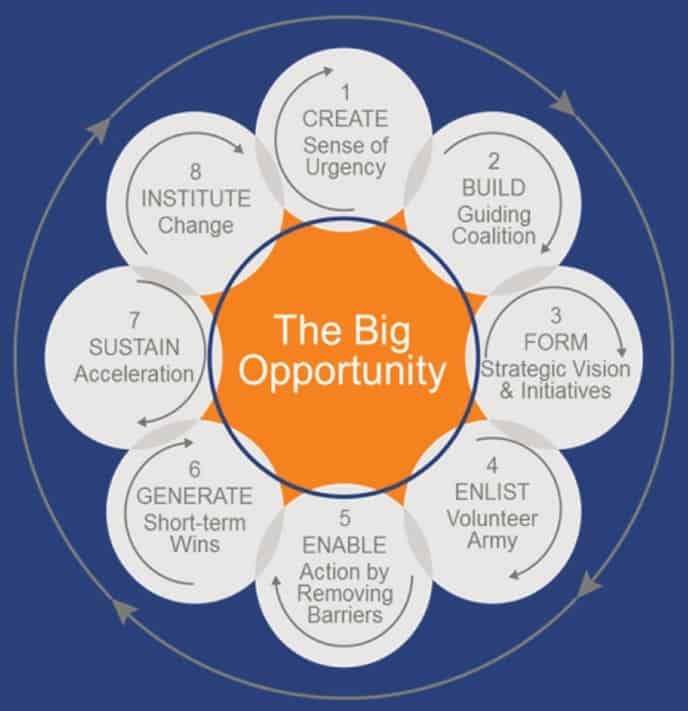 Below you will find 8 essential steps to ensure your change initiative is successful. Since most change occurs to improve a process, a product, or an outcome, it is critical to identify the focus and to clarify goals. This also involves identifying the resources and individuals that will facilitate the process and lead the endeavor. Most change systems acknowledge that knowing what to improve creates a solid foundation for clarity, ease, and successful implementation. There are several layers of stakeholders that include upper management who both direct and finance the endeavor, champions of the process, and those who are directly charged with instituting the new normal. All have different expectations and experiences and there must be a high level of "buy-in" from across the spectrum. The process of onboarding the different constituents varies with each change framework, but all provide plans that call for the time, patience, and communication. This is the "roadmap" that identifies the beginning, the route to be taken, and the destination. You will also integrate resources to be leveraged, the scope or objective, and costs into the plan. A critical element of planning is providing a multi-step process rather than sudden, unplanned "sweeping" changes. This involves outlining the project with clear steps with measurable targets, incentives, measurements, and analysis. For example, a well-planed and controlled change management process for IT services will dramatically reduce the impact of IT infrastructure changes on the business. There is also a universal caution to practice patience throughout this process and avoid shortcuts. As part of the planning process, resource identification and funding are crucial elements. These can include infrastructure, equipment, and software systems. Also consider the tools needed for re-education, retraining, and rethinking priorities and practices. Many models identify data gathering and analysis as an underutilized element. The clarity of clear reporting on progress allows for better communication, proper and timely distribution of incentives, and measuring successes and milestones. This is the "golden thread" that runs through the entire practice of change management. Identifying, planning, onboarding, and executing a good change management plan is dependent on good communication. There are psychological and sociological realities inherent in group cultures. Those already involved have established skill sets, knowledge, and experiences. But they also have pecking orders, territory, and corporate customs that need to be addressed. Providing clear and open lines of communication throughout the process is a critical element in all change modalities. The methods advocate transparency and two-way communication structures that provide avenues to vent frustrations, applaud what is working, and seamlessly change what doesn't work. Resistance is a very normal part of change management, but it can threaten the success of a project. Most resistance occurs due to a fear of the unknown. It also occurs because there is a fair amount of risk associated with change – the risk of impacting dependencies, return on investment risks, and risks associated with allocating budget to something new. Anticipating and preparing for resistance by arming leadership with tools to manage it will aid in a smooth change lifecycle. Recognizing milestone achievements is an essential part of any project. When managing a change through its lifecycle, it’s important to recognize the success of teams and individuals involved. This will help in the adoption of both your change management process as well as adoption of the change itself. As much as change is difficult and even painful, it is also an ongoing process. Even change management strategies are commonly adjusted throughout a project. Like communication, this should be woven through all steps to identify and remove roadblocks. And, like the need for resources and data, this process is only as good as the commitment to measurement and analysis. Due to ever-changing consumer expectations and the competition in the global economy, the science of organizational change is itself constantly changing and evolving. The human element of change management may be one of the most difficult to navigate because people do not inherently like change or adjust to it well. Most change methods agree that change is difficult and cumbersome. Therefore, involving people early on, implementing process, and continuously adjusting for improvement is critical to success. This includes thorough planning, buy-in, process, resources, communication, and constant evaluation. Today, there are numerous proven methodologies. Some models focus on changing the individual as a method of cultural change and some have structures and frameworks to move an entire organization towards focused change and improvement. There is no one "right" solution, but with research, exploration, and resource planning, a change management strategy is possible regardless of organization size or need. If the explosive growth in the change management industry is any indication, the business of change is here to stay. As the healthcare industry looks to digital transformation to optimize their processes and procedures, the need for change management best practices has become even more apparent. Clinical tests and trials, healthcare credentialing, team onboarding, and clinic openings are all processes in need of a more streamlined, automated approach. However, implementing change in a healthcare organization requires high-level visibility into updates, efficient organization of contracts and timelines, and secure documentation and storage of confidential information. As the demand for better, more standardized processes increases, the need for a collaborative, visible, and real-time tool is more apparent than ever. Smartsheet is a work execution platform that enables healthcare companies to improve work efficiency, scale repetitive processes, and securely store and share protected health information compliant with HIPAA’s regulatory requirements. Streamline documentation, improve communication across your organization, and modify healthcare processes for the better, while also maintaining top-level data security and compliance. Interested to learn more about how Smartsheet can help you maximize your efforts? Discover Smartsheet for Healthcare. Smartsheet is a work management and automation platform that enables enterprises and teams to work better. Organizations embracing change management methodologies can utilize Smartsheet’s features to streamline documentation, improve communication, and modify work styles. 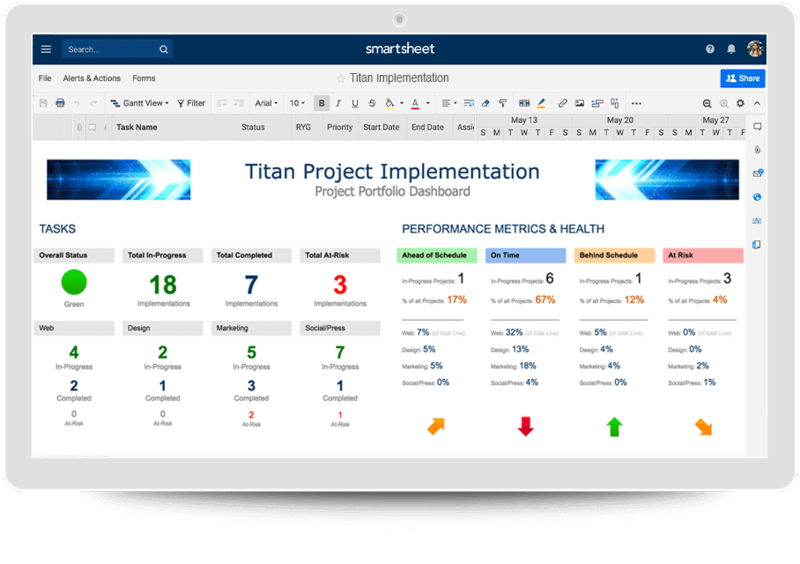 During the strategic planning phase, you can use Smartsheet to proactively chart your vision, align the right timelines, and empower your team members to share their ideas with an accessible model. Track the progress of your processes with Smartsheet Sights. Build a customized, centralized dashboard in Sights to surface key information and stay updated in real time. The automated reporting tool provides visibility into resources, status, and performance so you can quickly align operations to strategy. Ready to try Smartsheet for yourself and start managing processes with ease?